Home >> Blog >> Who Invented the Limousine? The history of the limousine begins not in Hollywood, not in New York City, but in a damp upland clover meadow bordered by French Oak trees in Limousin, France, circa 1500. On the edge of the meadow is a shepherd wearing a long cloak with a baggy hood for defense against mountain winds. Fast forward a hundred years. French nobles no longer trudge through muddy city streets, but are carted about on Sedan Chairs like medic stretchers. Then some bone-weary worker lashes his horse to his Sedan Chair, and the horse-drawn buggy is born. By the late 1700s, Paris alone has more than 14,000 horse-drawn carriages. Talk about an emissions problem. But driver and drivee still occupy the same space inside the carriage. Rain, mud and catcalls fall on both. So someone, forgotten by history, erects a partition between the chauffer and the noble, thereby birthing the first horse-drawn limousine. From now on, wealthy passengers will sit inside a closed carriage while the horseman sits outside, wearing a “Limousin” cloak as he whips the horses through long, lonely nights. Then Benny Goodman, the “King of Swing,” shows up to one of his concerts in a brand new stretch limousine, developed by coachbuilder Ambruster just that year in 1928. Out steps the bespectacled Goodman with his musical instruments; in steps the era of “big band buses.” Stretch limousines are used to transport famous figures like Glenn Miller and Benny Goodman and their entourages. The Great Depression may have damped business during the 1930s, but it doesn’t dampen creativity, nor does it dampen Hollywood stardom. Enterprising heads send limousines rolling in two different directions. Limousines are used as airport shuttles – and to mark the debut of a Hollywood superstar. Roll up with a chauffeur and a long chassis, Hollywood says, and you officially “made it.” Many of these luxury limousines come courtesy of James P. Carey, a crystal ball entrepreneur who renovates a New York City cab company into a wildly successful luxury limo service. Leave it to Cadillac to make things even bigger. In 1962, coachbuilder Armbruster merges with Stageway Coaches from Cincinnati, Ohio to form Armbruster-Stageway Coachbuilders. Twelve years later, the company builds the first six-door modern limousines on Cadillac chasses. They are sleek, low-slung, and will soon see use in funeral and security transportation. 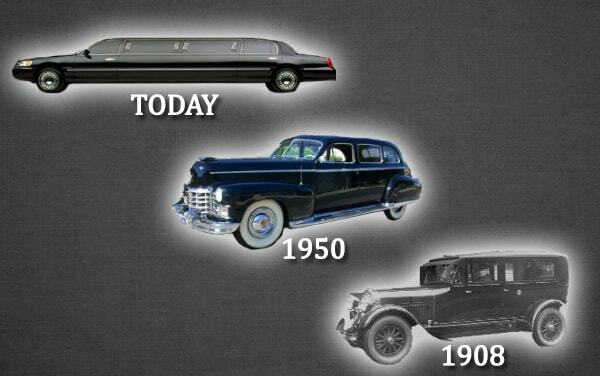 By 1978, automobile limos have been puttering about the globe for more than three-quarters of a century. Yet the nation claims only 1,500 or so limousine operators. It is the time when the middle class still reigns, when being rich means taking a summer vacation and sending a kid to college. Then comes the ‘80s: the stock market booming and oil prices skyrocketing and banks blossoming and the advent of the Internet. Fortunes quadruple, quintuple, and it is on that wave of corporate success that the limousine will ride. Custom limo builders pop up like daisies, offering air-conditioning, leather upholstery, power locks, and other super-modern features to entice customers. In 1987, the stock market crashes, and so does the limo market. And so it has been ever since. Limousine builders continue to offer the latest in comfort and technology. Affluent brides and business executives scurry in line. Then the next bear market hits, the phoenix burns, and the limo rolls on.